Aromatic dog spray with a fresh floral, herbal, fruity aroma that can be applied on your pets coat, giving instant refreshment. Ideal for applying following bath time. Great for fireworks and car sickness, Floral Spray has a natural calming and balancing quality, providing ultimate relaxation for your pet. Plus, naturally occurring Linalool, Geraniol and d-Limonene. For external use only. Do not spray on the dogs face. Store in a cool, dry place. Avoid contact with eyes. In case of contact with eyes, rinse immediately with plenty of water. Keep out of reach of children. Keep upright. DO NOT USE ON CATS. Rosie is a two year old wire fox terrier who has been trained weekly since she was 12 weeks old. Rosie was a happy friendly puppy and would let anyone pet her and was keen to have affection from anyone who was prepared to give it. We had no problems at this time with the vet or groomer, and she was happy to be touched, this was not to last! By the time she was around 10/11 months she suddenly changed and would not let the vet or groomer touch her – well not without a muzzle and a great amount of effort. Rosie would appear to want a pet, wagging her tail but then she would growl and mouth – never biting but enough to say leave me alone and make you jump. No one was able to touch her other than my husband Sean and myself. Rosie also became more growly and snappy when passing other dogs whether big or small. This was random and sometimes she was happy to be with other dogs and wanted to play. Rosie is hand stripped we did wonder if this was the cause although she was fine in the beginning and had been introduced to the grooming process over a period of months gradually increasing the time. Rosie was happy to go until this change occurred; it really was as sudden as that, she was a different dog with other people but just as loving to Sean and myself. We have taken Rosie to two behaviour specialists and this is still work in progress. Rosie was also checked out by a chiropractor to ensure there was physical reason, although she had been checked out by the vet several times. It was found she had a back problem which was rectified but it didn’t change her behaviour. The groomer we were using did not want to continue with my grisly dog and I felt helpless and struggled with hand stripping. On my first visit to Vita Canis Jitka assessed Rosie and was not at all hopeful. Jitka was not even able to stand by Rosie when she was on the grooming table, growling and generally making it known that she did not want to be touched. Our first session was a full day training me to hand strip – to be honest I thought I would be on my way home within the hour! Jitka used Vita Canis Floral Spray and Low OM Tuning Forks – it took 30-40 minutes before we were able to start. Whilst we did muzzle her Jitka was able to start grooming and Rosie allowed her to touch. After a break we started again, this time it took 20 minutes to settle Rosie again using the Low OM Tuning Forks and Floral Spray. By the end of the day Rosie settled within 10 minutes, fell asleep on the grooming table and let Jitka cuddle her! Seeing was believing – I would never have thought such a thing could work, it was truly amazing. I left at the end of the day with hope and a wire fox terrier that looked like a wire fox terrier! We decided to have monthly visits and have since been three more times so far. Each time we use the Floral Spray and Low OM Tuning Forks. The time it takes to settle Rosie down has become less and less, on our last visit in April it took only 5 minutes! On this visit Jitka stroked her as soon as I put her on the grooming table with no muzzle . If you had asked me in January whether we would be at this stage within a few months I would have said it would be highly unlikely and more chance of me going to the moon! Jitka was able to groom Rosie’s head for the first time, and although we didn’t manage the complete session without a muzzle we managed the first 20 minutes which is truly remarkable. Since purchasing my own tuning fork, I use it when in training or visiting the vet as it helps calm her. She is still reluctant to be handled by other people but it has improved and she does allow some people to touch her – but it’s her choice! I had been told perhaps my dog, my lovely Rosie, was un-fixable and probably would never be able to be groomed. I cannot tell you how grateful I am for the support and perseverance Jitka has shown to Rosie and we are now hopeful that at least the grooming issue can be overcome. If I hadn’t seen it with my own eyes I would never had believed it. It was truly amazing. 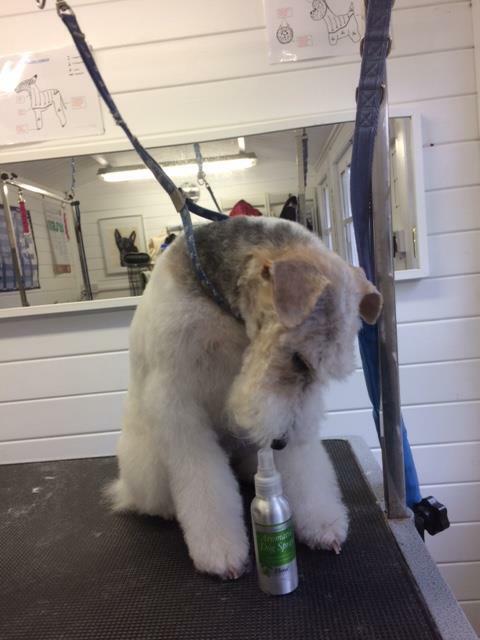 As a groomer I want my dogs to feel relaxed and happy in the salon, this is Baxter rescue Fox Terrier adorable little boys but so nervous, spraying the Aromatic spray in his environment really helps this little guy to calm down and enjoy his groom. Love this product. It smells amazing and helps to calm nervous dogs. I’m a dog groomer so have this on hand for nervous or anxious dogs. I also give the room a little spritz and towels to help keep the dog at ease throughout grooming and you can see the benefits.